I was born on the very day that "The Greatest American Hero" debuted with it's 2 hour pilot. My dad always loves telling me me that he remembers sitting in the waiting room(I had a problematic birth) and seeing the show. I never realized that it was the debut. I've never actually seen the show, but I'm definitely going to make time or it very soon. So, any idea what was on the tube when you were born? At about the 90 minute mark movies (especially current ones) are wrapping up. Not "Lawrence of Arabia." At about 90 minutes "Lawrence" is hitting it's stride! Ok I admit the title of this one was a cheap joke but come on, "Dr. Strangelove" has like one of the most awesome full titles of all time. I just couldn't resist. So, back in May I smashed my ego into bits by taking a little IMDB top 100 challenge. The object was simple, take the IMDB top 100 movies list from May 2004 and throw a bold font on the ones you have seen. I clocked in at 46, pathetic. I couldn't even break the halfway mark. But a few months have past and I have knocked off a few more (ok only 9 plus one that I had seen previously but missed it when marking.) notches off of the old IMDB belt. Grand total now, 56 which puts me above the halfway mark. So here is the updated list. For clarity here is the list of the newly viewed. That may not seem like a lot, but with these flicks you are definitely talking about quality over quantity. “Das Boot” was going to be on the updated list, is it on my desk right now. Unfortunately the local Blockbuster store was kind enough to rent me an unplayable DVD (not the first time this has happened) so I had to kill that plan. On the upside “The Shawshank Redemption” played just fine and completely exceeded my already high expectations. I expect I'll be spending more time in Shawshank, perhaps sooner than later. Jaws: Made me realize that Spielberg really did come right out of the gate running at full speed. A Clockwork Orange, Dr. Strangelove, and 2001: Taught me that Kubrick movies really should be viewed multiple times to appreciate them. “Clockwork” Also gave me a completely renewed respect for Malcolm McDowell. 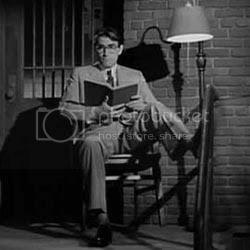 Rear Window: There is no way that Shia LaBeouf can trump James Stewart, I'll withhold final judgment until after I see “Disturbia.” But I'm not holding my breath for it to surpass the Hitchcock classic. 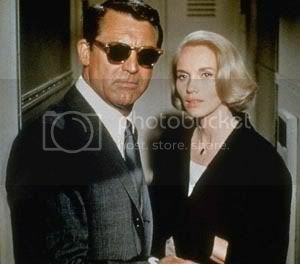 North by Northwest: Really fun movie. After all it is “A 3000 MILE CHASE . . . That blazes a trail of TERROR to a gripping, spine-chilling climax ! “ Sorry, I just love that tagline. Also...Is it me or did Hitchcock have a really good eye for the ladies? Raging Bull: Brutal! Really good as well, but I mean damn......brutal. To Kill a Mockingbird: I think I've made my opinion fairly clear and I still stand by what I said! Citizen Kane: I really wish that I could go back and erase what little I knew about this movie going into it so I could have experienced the surprise at the end without knowing it was coming. The Shawshank Redemption: It's funny, I've seen bits and pieces of “Shawshank” here and there for years but I never put the puzzle together. Once I sat down and watched it from beginning to end it really blew me away. By the way, how great was James Whitmore's performance? One more thing, just for the record. 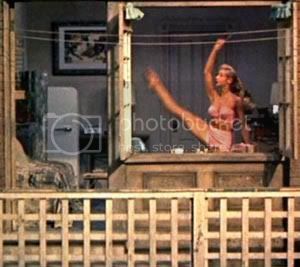 Pulling an all niter featuring “North by Northwest” followed by “Rear Window” is pretty awesome, if you can pull it off. A brief video interlude while we iron out some technical difficulties. Well....my plan was to talk about the experience of watching 209 minutes of subtitled "Das Boot" a movie that is on the top of many lists and as usual I have yet to see. Unfortunately once I got home with the DVD and popped it into my player I was met with artifacts, screeches and eventually a freezing screen. Large deep scratches and near gouges disc can do that. I'm not super upset, these things do happen, I'll just put it on my online rental queue. The thing that always worries me is that I'll get a jerk at the local store who will think I did the damage. Gonna take it back in tomorrow, we'll see what happens (I need to think of a suitable replacement since I know they only have the one copy of that movie). So, instead of actual content how about a couple of videos followed within 24 hours by a progress report on my IMDB list quest. Video 2. A picture tribute to some of the women of film. I don't think this will need an explanation. hmmm...how about one more. Because the Sci-Fi channel is currently reminding me that it is time to watch the actual movie again here is a little bit of Flash Gordon!